In frost prone areas grow as a house plant or in a glasshouse/conservatory. In warmer climates grow in a gravel or well- drained rock garden. They are ideal as container plants that can be brought inside during the winter months if necessary. Grow the same variety in clumps,or mix with other Echeverias or succulents for maximum effect. 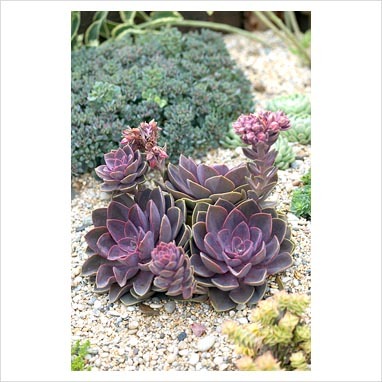 Echeverias like poor to lightly fertile, well drained or gritty soil in full sun. They produce new plants as off shoots from the mother plant. See our Echeveria listing for individual information. Ophiopogon Nigrescens. Unusual, clump-forming, rhizomatous grass with very dark, green leaves, turning to black in the sun. In summer they bear pretty pale pink, bell-shaped flowers, contrasting well with the black leaves. Plant in groups of 3 for a greater impact.